(2 Customer Reviews) | Write Review 12 issues per year Electronic Sound is the best electronic music magazine in the world. Designed for the thinking futurist, you’ll find in-depth coverage of the current scene alongside the pioneers, the machines and the current thinking of the electronic music world. CD cover mounts attached to the print version of Electronic Sound are not available to digital purchasers. Electronic Sound is the best electronic music magazine in the world. Designed for the thinking futurist, you’ll find in-depth coverage of the current scene alongside the pioneers, the machines and the current thinking of the electronic music world. You'll receive 12 issues during a 1 year Electronic Sound magazine subscription. 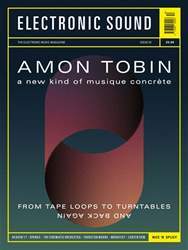 You'll receive 12 issues during a 1 year Electronic Sound magazine print subscription.